I say “be sulphite aware” like you probably already are but if you’ve never (knowingly) crossed swords with these things, you may not have a clue what I’m talking about. Sulphites are a preservative slipped into all sorts of food and particularly wine (and then, particularly, white wine) but look out for them and you’ll start noticing them everywhere, especially in processed food. I’ve mentioned before that my tolerance of alcohol has never been lower than it has this last decade with fibromyagia and, even more so, this last couple of years so that even my one-time beloved red wine has slipped off to somewhere remote, not seen by my tastebuds for at least a couple of months now. Alcohol, after all, is a ‘posion’ to our system, whatever they may say about the benefits of sipping a glass or two a day (blood thinning effects and so on…) and if your system is already struggling to process toxins through your cells, or you are working very hard – as I am – to get stored-up toxins out, through sauna and great diet and so on, then you may start to notice the negative effects of alcohol even more than you ever did, yes even more so than when you binge-drank in your twenties (if you ever did that). You might start to notice those ‘subtle’ symptoms you never used to pay attention to, such as the bloat or the nasal congestion, after enjoying a drink. Throw in the effects of menopause and you might start to notice that drinking isn’t the carefree pleasure it used to be; a phenomenon reported by many women but is it just the alcohol they can’t seem to process any more or is it the additives? Because, alcohol aside, sulphites seem to be a whole other story when it comes to the toxic after-effects of certain drinks and I when I first started to connect this dot it shed so much light on the ups and downs of my reactions to different kinds of wine, sourced from different places, that it came as a real breakthrough in my understanding – and my habits. What I’ve found is that I can still drink reliable sources of alcohol, in moderation, punctuated by lots of water, preferably with food – but, if it contains too many sulphites, I suffer horribly – and I mean really really horribly – the next day or for even longer, regardless of how little I consume. What happens next can feel like one of the worse hangovers of my life and then some; like a full-scale toxic situation with widespread body pain of the severest kind. Guess what, that’s where I am today – after a very rare trip out to the pub last night and a glass or two of prosecco over dinner to celebrate the opportunity we had to sip this in a sunny pub garden on a warm summer’s evening free of parenting responsibilities. So why prosecco, you may ask – well, I’ve actually found that I ‘get on’ better with this than standard white wine, these days (and red wine is something I find harder to process in other ways), so its become a sort of hierarchy of preference for those infrequent times when I have a drink. So, ironically, I actually thought procecco was the safe option and, at home where we stick to tried and tested brands, it is…but, it turned out, this non-too-cheap bottle of pub prosecco of unknown label, alternated with plenty of water, of which I had a couple of modest glasses, was not fine and today I hurt so much its quite ridiculous, along with a significantly distended stomach that looks like I swallowed a football. I’ve tried every remedy I can think of but nothing is decreasing the widespread pain I’m experiencing, from the super-intense, just awful headache to the full-blown all-over muscle burn that just–won’t–switch–off!! 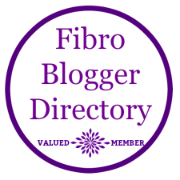 So, I’m back to suspecting, and looking at, sulphites again – and there is plenty of information and a great many anecdotes out there from others similarly afflicted, included an e-book I chanced upon by someone claiming that giving up sulphite-containg food cured his fibromyalgia. In this book ‘The Sulphite Connection‘, natural therapist Paul Barratt-Hassett describes sulphites as being responsible for “a global pandemic” of symptoms, syndromes, illnesses, even some deaths. He refers to them as being toxic, with no legitimate place in the food chain – and our modern diet is quite literally full of them. Interesting stuff to look into if this is ringing any bells for you – its certainly ringing a loud, very painful bell in my head today as I remember (once again) to check the label of whatever I drink, however much the occasion may seem to warrant the kind of carefree abandon that others take for granted. Interestingly enough, we spent last Friday eating out at a fantastic vegetarian restaurant called Cafe Roya. Not only is the food menu super conscious but so too is the drinks menu, with all of the very extensive selection of drink available selected for both its organic and vegan status and its bee-friendliness. 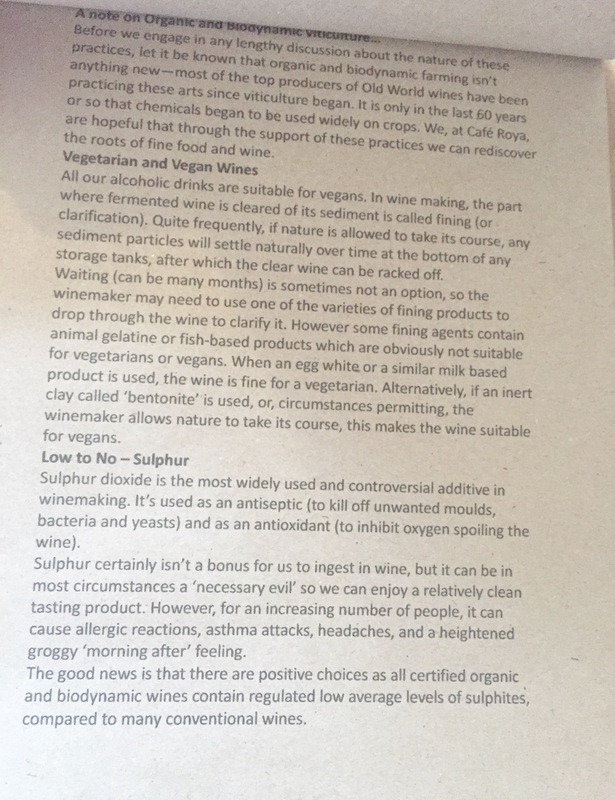 To the side is a shot of what that menu had to say about sulphites… their wine being carefully selected for its low average levels of sulphites compared to typical wines. Suffice to say, I was able to enjoy a shared bottle with minimal after-effect, just a subtle wave of feeling slightly under par the next morning, which could also be attributable to travel-tiredness given we were away for the weekend; I certainly didn’t experience anything like the toxic attack that I feel that I am under today. I think its time I started looking into organic wine sources in a serious way. All I can hope is that by sharing this around I might help others to join a missing dot in their own over-reactions and that my body goes back to some sort of normal very soon. I am also comforting myself that this is just my body’s no-nonsense way of getting the message through to me that I need to take what I consume seriously all of the time. I’m thrilled to be able to continue enjoying the occasional glass of wine at home but next time I’m in a pub, I think I’ll stick to the water! Will take a lok, thanks Cathy!